Earlier this week, Mazda took me to Frey’s Mazda Classic Car Museum in Augsburg, Germany—a gorgeous museum in an old 19th century tram depo filled with 120 classic Mazdas. Feast your eyes on true beauty. 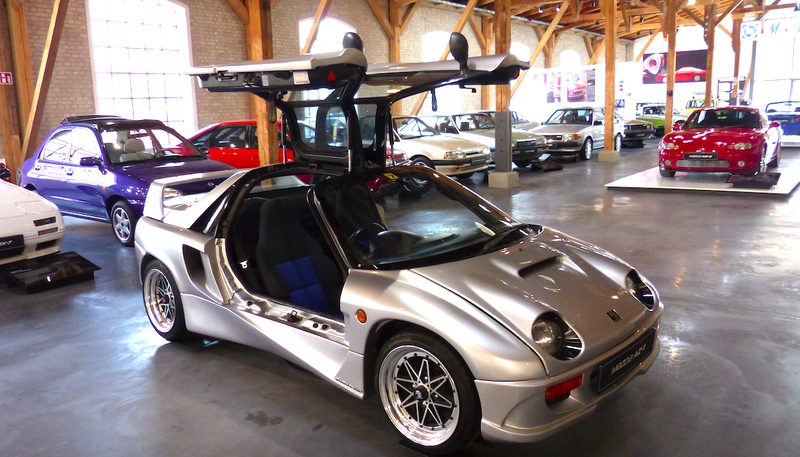 The museum was founded by one of Germany’s first Mazda dealers, Walter Frey, who decided to start selling the cars in 1978 after becoming fascinated with Wankel engines. In 1980, Frey bought a Mazda Cosmo Sport from New Jersey, marking the beginning of what would become one of the greatest collections of older Mazda vehicles in the world. Markus started by introducing us to Mazda’s first vehicles: three-wheel delivery trucks. It all began back in 1931 with the Mazda-Go Type-DA model, which had a 9.5 horsepower air-cooled single-cylinder four-stroke, and a max payload of about 1,100 pounds. The 1950 blue Model GB-Three Wheeler in the picture above has a 700 cubic-centimeter, single-cylinder gas engine making about 15 horsepower; it was among over 30 variants of three-wheelers that Mazda made after the original Type-DA. At one point, the former Cork company sold 130,000 of these types of vehicles each year. Among my favorite of the three-wheelers is undoubtedly the K360, a Kei Car three-wheeler pickup with a 358 cubic-centimeter air-cooled V-twin making about 16 horsepower. This was Mazda’s first enclosed-cab vehicle, and was a huge success with about 280,000 sold between 1959 and 1969. But the K360 was just the beginning of Mazda’s Keis. The company’s first real car with four wheels was the R360, a little coupe that also had an air-cooled 16 horsepower V-twin out back. It was a roaring success, winning 65 percent of the kei-car market share, thanks in part to its lightweight construction (it was the lightest car in Japan), and its innovative two-speed semi-automatic transmission with torque converter. Between the K360 and the R360 sat a Mazda Carol, also a Kei Car. It joined the party two years after the R360, in 1962, and offered seating for four (the R360 technically had seats in the back, but they were tiny). It even came in a four-door version starting in 1963, and was powered by either a 358 cubic-centimeter, rear-mounted, liquid-cooled inline-four, or a 586 cubic-centimeter inline-four (cars with the bigger engines were called the Carol 600s). Of course, Markus also showed us the Cosmo Sport 110S, the vehicle that started it all for the rotary madness that would later define Mazda. Launched in 1967, the Cosmo’s 10A engine was the first two-rotor rotary to ever propel a sports car. Also on display was a 1984 Mazda RX-7 GSL-SE, which Markus told me Mazda gave to Felix Wankel as a gift (Wankel allegedly couldn’t drive the car, because he had no license). And then there was that amazing Pathfinder I wrote about yesterday. The whole thing was just madness, and really drove home just how amazing and totally weird Mazda’s history is.